Industry Experts, Inc. introduced a unique market research report on global Seaweed Hydrocolloids. 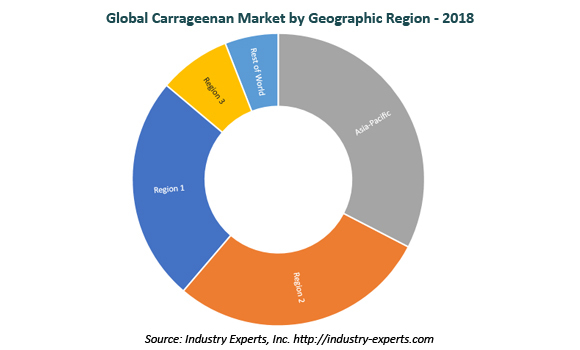 The new report entitled "Global Seaweed Hydrocolloids Market – Agar, Alginates and Carrageenan" reveals that the Food & Beverages consumes the lion’s share globally with an estimated 94k metric tons in 2018. Hydrocolloids are a diverse group of long chain polymers which interact with water to form colloid systems of solubilized particles either in the form of gel or a sol (liquid) system. Commercially available hydrocolloids are obtained from several sources: isolated from plants and seaweed without chemical modification; obtained by fermentation; plant-derived hydrocolloids that are chemically modified; and extracted from animals. Seaweed hydrocolloids are commonly extracted from wild and cultivated red and brown seaweed. The principal commercial seaweed hydrocolloids are agar-agar, alginates, and carrageenan. This report explores the market of seaweed hydrocolloids types comprising Agar-Agar, Alginates and Carrageenans. The study also analyzes the key end-use applications of seaweed hydrocolloids including Animal Feed, Food & Beverages, Pharmaceuticals & Healthcare, Cosmetics & Personal Care, and Industrial/Technical applications. The study comprehensively provides an in-depth analysis for each product type in various major applications and vice-versa. The global market report reviews, analyzes and projects the Seaweed Hydrocolloids global markets for the period 2015-2024 in terms of volume in metric tons and value in USD. The regional markets further analyzed for 22 independent countries across North America – United States, Canada and Mexico; Europe – France, Germany, Italy, Poland, Russia, Spain and the United Kingdom; Asia-Pacific – China, India, Indonesia, Japan, South Korea, Malaysia and Thailand; South America – Brazil and Argentina; and Rest of World – South Africa, Turkey and Ukraine. This 644 page global seaweed hydrocolloids market report includes 502 charts (includes a data table and graphical representation for each table), supported with a meaningful and easy to understand graphical presentation, of the market. This report profiles 25 key global players and 73 major players across the North America – 6; Europe – 13; Asia-Pacific – 47; South America – 5; and Rest of World – 2. The report also provides the listing of the companies engaged in research & development, manufacturing and supply of seaweed hydrocolloids. The global list of companies covers addresses, contact numbers and the website addresses of 120 companies.